Law at the End of the Day: Arturo Lopez-Levy & Rolf Otto Niederstrasser: "Five Keys to Presidential Change in Cuba"
Arturo Lopez-Levy & Rolf Otto Niederstrasser: "Five Keys to Presidential Change in Cuba"
The recent transition of leadership in Cuba, through which Raúl Castro ceded the Presidency of the Republic to Miguel Diaz-Canel (while retaining the position of 1st Secretary of the Cuban Communist Party (PCC)), has elicited at least some interest outside of Cuba. At a minimum, the transition spoke to the inevitable passage of time and pointed to the shape of Cuban leadership once the generation of "los históricos" pass from the scene through death or old age. While I agree that history does at times produce historical events that serve as markers of transitions, I was less eager than others to see in this change in the Cuban presidency some sort of transcendent change pointing to something like fundamental regime change--either within the meaning of those terms in Cuba's governance structures, or as it has come to be understood in places like the United States. Seeing much more continuity than transition, I thought it was an interesting change that merited some attention. (More here: Transitions to Entertain and Distract the West). Recently, Arturo Lopez-Levy & Rolf Otto Niederstrasser produced their own analysis of the transition in an essay well worth reading, even if one takes a different view. 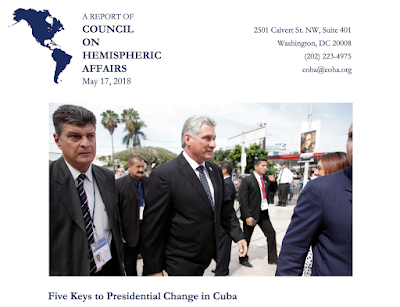 In "Five Keys to Presidential Change in Cuba"They quite correctly note that "Few transitions of leadership in the history of Latin America and the communist countries have been so carefully designed. From now until the eighth congress of the Communist Party of Cuba (PCC) in 2021 it will be necessary to observe how skilled and unified the Cuban elite is to execute it." They discuss the importance of the transition in five aspects: "1) the generational transition, 2) the first rise of a civilian to the presidency since 1976, 3) the separation of the heads of the Communist Party (CCP) and the government in the post-revolutionary political system, 4) the circulation of networks of influence and patronage within the Cuban elites as a result of the arrival of a new executive chief, and 5) the challenges of the new administration in foreign policy." These are each worthy of some consideration. On April 19, Cuba unveiled the first inter/generational leadership transition after the 1959 revolution. Raúl Castro, who rose to the presidency of Cuba temporarily after his brother Fidel’s illness in 2006 and permanently in 2008, that led a remarkable transformation of the island’s economy and politics of the island but leaves an unfinished legacy to his successor. The new National Assembly elected to a Council of State and named Miguel Diaz-Canel, a 58-year-old former provincial communist party czar as president of the new Council of State. The new leadership introduces an expansion of black representation at the upper echelons of the government. The first vice-president Salvador Valdes and two of the other five vice-presidents were afro-descendant.